The MR team I'm part of at Mozilla finally released it's first social product, the beta of Mozilla Hubs. Needless to say, we're all pretty excited! At first glance, you might think "Ok, great, another social VR product, so what?" But if you dig in a bit, you can start to see how this is really game changing. Most obviously, Hubs is built entirely with standards-based web technology, so it'll run in any modern browser, from desktops with high-end WebVR support down to mobile phones and tablets. It lives on the web, doesn't require installs or downloads, no accounts or registration, no big corporations watching what you do an monetizing you. You aren't the product, you're a person, and your rights and privacy matter: now you can have social 3D experiences using VR, AR, desktop, or phone, whatever your preference, anytime and anywhere. For me, though, the most exciting part is what follows from that. Hubs is not just on the web, it's open source and designed to be open and integrate with web-based tools. Greg mentions some of the team's plans in the blog post, but regardless what Mozilla does with this product, the underly technology will eventually let anyone host their own social virtual worlds, customized for their own purposes. Custom XR social spaces, as you need them to be: bespoke social XR. A view near my old Georgia Tech office, with some SecondLife avatars hanging out via our AR SecondLife client. Over the years, I've thought a lot about what it might mean to use virtual worlds for teaching, but it's always been to hard to do this in practice. Like many researchers, we explored SecondLife and similar environments, at one point creating our own AR client for SecondLife, and having students do projects in the virtual world. We've tried using Sun's WonderLand virtual world, so we could create and host our own servers, as well. But these systems were all fatally flawed in one way or another, when we dug in and tried to make them work the way we wanted. Hubs is different. It's structured with a goal toward repurposing it, and the technology on which it's built is only going to get better. While it's going to be a while till the underlying system can be "dropped in" to another web app, it's not inconceivable that it might get there some day. 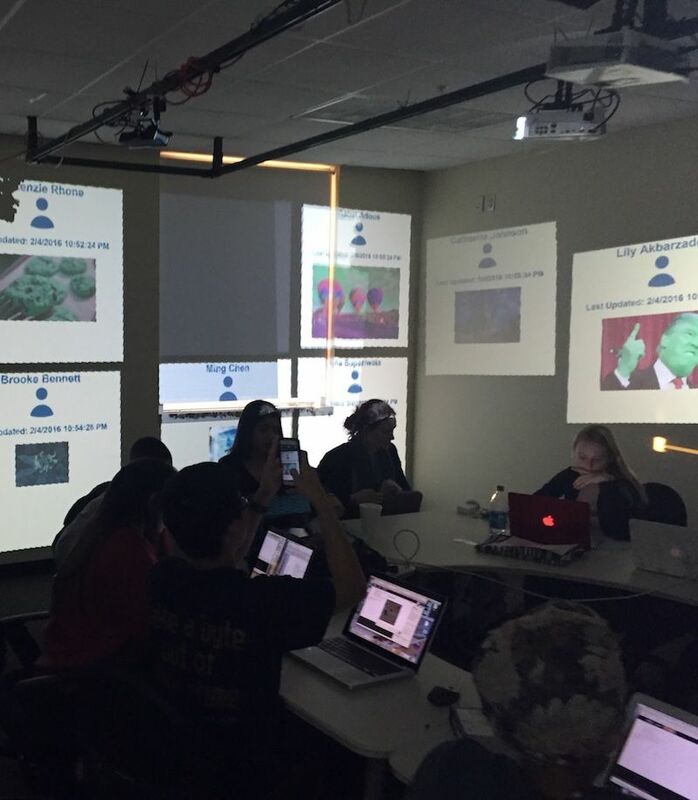 Students in our projection-AR studio, where the pictures they are working on are scattered around the walls of the room. As one example, I'm looking forward to exploring how to use this technology as the basis for educational environments. Its easy to imagine creating bespoke social XR systems that integrate with institutional login and courseware systems (for example), include unique content and technology per class, and so on. I'm not specifically interested in the typical idea of using 3D environments to teach something specific (i.e., experiences in VR or AR with an education goal for math or physics or anatomy or whatever), but environments that support learning more generally, that let us change pedagogy and the way students access materials, communicate and work. We explored this idea with projection AR and CS recitations in the past, but technology like the Hubs may soon let us explore these ideas in much bigger ways. Beyond education, imagine any situation where you might want to have a social experience that integrates with some work practice or social environment. Right now, you might use a combination of video and Google Docs or screensharing. With the release of the Hubs beta, we can finally start to imagine a (near) future where it's easy to do these things smoothly, privately and easily in virtual worlds.